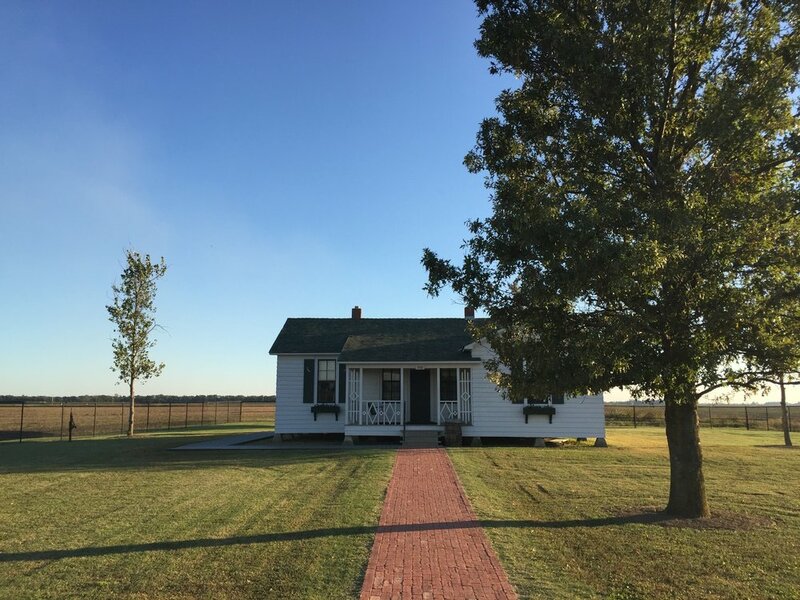 In October of 2017, I had the opportunity to present a talk at a symposium as part of the Johnny Cash Heritage Festival held at Johnny Cash's childhood home in Dyess, Arkansas. While, the video recording is not available, this post summarizes the main points of the project which focuses on analyzing trends in Johnny Cash's lyrics and specific audio qualities in his music. In the summer of 2016 I started a much appreciated five-month parental leave from Spotify. My son and I quickly developed a routine, choose a playground or water park and in the morning, play hard until lunch, and crash for a few hours nap. It was during one my son's naps I had an idea. Johnny Cash created music for across six decades and developed an enormous catalog of material. I decided, since I suddenly had so much free time, I would listen to all of Johnny Cash's commercially released albums in order of first release. It turns out there were a few albums I couldn't get my hands on. But in the end, I listened to 72 albums and 856 unique recordings across mainstream, live, gospel, soundtrack and Christmas material. As I went along, I read biographies, researched discographies, and analyzed his lyrics and audio. Starting out, I was unsure what I would find. But along the way, what started as faint patterns emerged as trends across the entirety of Johnny Cash's creative work. This post explores the first of these trends. "I suppose I’ve written close to a thousand songs in the last twenty years, and there has really been no particular pattern they follow: love songs, work songs, songs about real people, songs about imaginary people and things, tragedy songs and gospel songs." When I first read this statement, it sounded like a challenge, especially the idea there's no particular pattern to his lyrical themes. At this point, I had listened to hundreds of Johnny Cash songs and had an intuitive sense of a vague pattern. But it's impossible to make assessments about patterns in such a large amount of material just using human memory. To investigate further, I used a method called Topic Modeling which is an algorithmic approach to uncovering latent structures across a collection of documents. The documents in our case are Johnny Cash songs. 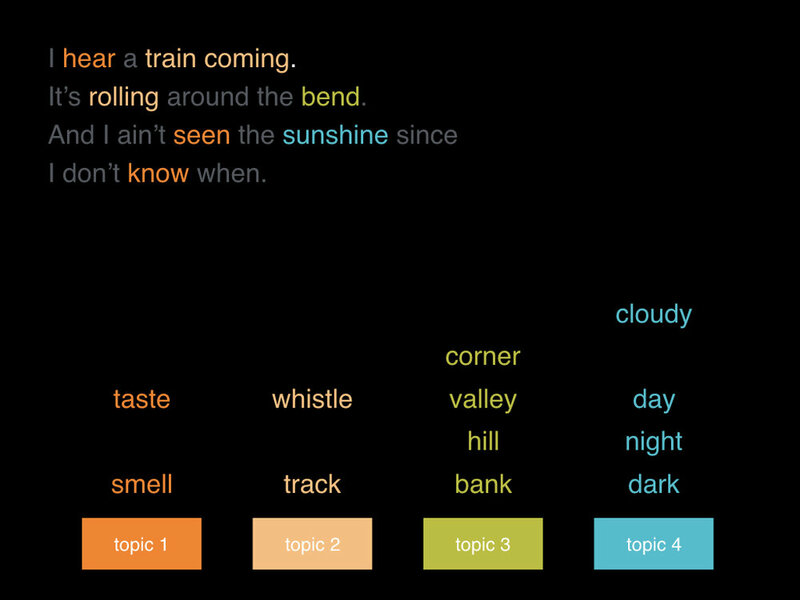 “Topics” are lists of words occurring in statistically meaningful ways across the collection. In other words, we’re trying to find hidden patterns we can’t see examining the collection song by song. The software I used, MALLET, is fairly straightforward once you preprocess your text and set up various configuration options. Preprocessing involves removing punctuation and stop words. Formatting an input file involves listing all tracks in one file as "instances" with a name, label and data. In our case, the name is a Spotify track uri, the label is the track's album name, and the data is the preprocessed lyrics. If you're interested in more detail, you can find a few good tutorials. 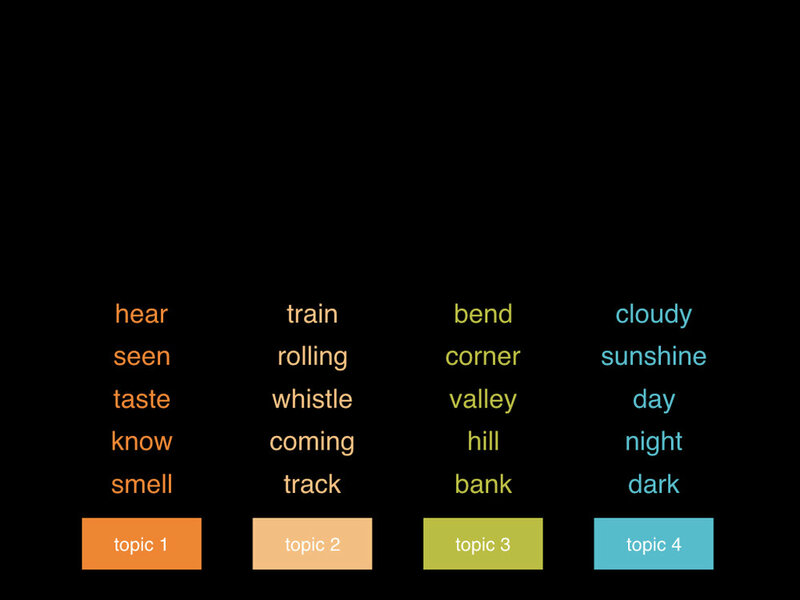 Topic modeling operates on the premise words with similar meaning appear in similar contexts. It assumes an author composes a body of text by borrowing from various buckets of words with similar meanings. Topic modeling attempts to reverse engineer this process and reveal the buckets of words most dominant across the collection of documents. We want to go from the songs to the underlying lists of words representing the dominant themes in Johnny Cash lyrics. A critical variable is, how many buckets do we use? In other words, how many unique themes did Johnny Cash sing about? If we choose too few buckets, the themes are mixed together and obscured. If we pick too many, single themes appear in multiple buckets. I created a topic model that uses 10 buckets. These are the corresponding word lists. Some topics are more interpretable than others. I believe the most interpretable and lucid topics, the highlighted topics above, are those rooted in his early childhood experiences growing up in Dyess. Trains are a vivid and strong symbol in Johnny Cash’s music. They are also connected to broad themes around freedom and the ever present option of trading one’s current situation for the romanticized fortunes of the open road. Variations on this theme are seen up and down this topic. Some songs are literally about railroads like “The Rock Island Line”. But trains are usually positioned metaphorically as a means of escape. It’s likely the driving motivations behind this theme are connected to his experiences at Dyess and the lure of life outside the colony. His early hit songs recorded at Sun like “Hey Porter” and “Folsom Prison Blues” clearly fall within the topic. It’s probably not a coincidence they are some of the first songs he wrote after he left home. The following playlist contains tracks in this topic ordered by the topic's weight compared to other topics. In other words, songs near the top are most easily recognizable as belonging to this topic. Considering he was a professional musician for most of his life, it’s not surprising he wrote about it. For example, “Down at Drippin’ Springs” presents his musical peers as a cast of characters. "All I Do is Drive" tells the story of a singer trying to find common ground with a trucker. "The One On the Right Is On the Left" off his album Everybody Loves a Nut uses the band as a comedic tool to contrast various political leanings. Biographers consistently recount a young Johnny Cash glued to the radio and following the popular acts of the 40s in his childhood home. It’s likely the early impression of show business formed at his kitchen table had a strong influence as he revisited this theme throughout his career. Love songs are not always about falling in love. They are about losing love, surviving when love has moved on and different kinds of love. This topic has the most examples across his material and contains some of his biggest hits like, "I Walk the Line". The loss of his brother Jack at a young age was obviously a formative event in his young life. It's possible Johnny Cash never disassociated love with loss having grieved the loss of a loved one at such a young age. Family separation was a familiar issue for families living through the Great Depression. Historians present a recurring theme in Dyess, the founding generation stays while the second generation moves out of the colony, usually to pursue life in a larger town or city. Issues around leaving home and facing unknowns in the outside world are seen in many of the songs associated with this topic. A great example is “A Boy Named Sue” from At San Quentin, written by Shel Silverstein. Anticipating his son’s inevitable drift from home, a father hedges natural selection and sets up lifelong, character building trial. Leaving home often meant moving to or through a city where unfamiliar territory often led to conflict with law enforcement. “Chain Gang” from Blood, Sweat and Tears is a great example. First hand accounts relate Johnny Cash's motivation to leave Dyess as soon as possible. After graduating high school, he traveled to various jobs before eventually enlisting in the Air Force and leaving for Germany. He would never return to live in Dyess, AR. It's likely he felt the lure of life off the farm and balanced the anxieties of leaving home like many of his generation. Finally, gospel music is an obviously identifiable theme in Johnny Cash’s music. Researches have studied this topic in depth. Johnny Cash made no secret of his Christian faith and interest in recording gospel music. Johnny Cash’s gospel music is often grouped as a project of its own, like he had a gospel side and a secular side. But he often asserted he’s one person and had no problem mixing gospel and secular music in the same context. As evidence, one of the more dominant songs in this topic is “Greystone Chapel” from At Folsom Prison. From his own account, his first experiences with music involved listening to his mother sing hymns and play the guitar and piano. When finally encouraged to record whatever he wanted, he first recorded his mother’s gospel songs, a clear indication his early music experiences at Dyess had a lasting impact. Now imagine we represent all these songs as single white dots on a long straight line, ordered by their initial recording date. On the left we have songs from the first Sun Sessions. And on the right we have his last commercially released recording, “Like the 309” from American V: A Hundred Highways. We can map recordings along the timeline to their topics. For example, here’s the top 20 songs from the “trains, open road, freedom, endless moving” topic. While there are gaps, he never completely abandons a topic. All of these appear in the major phases of his recording career. It’s also hard to predict just looking at the order of topics, when he’s likely to pick up a topic again. In other words, like he said himself, they follow no particular pattern. While we don't see a pattern in the sequencing, we can see Johnny Cash's most vivid themes are rooted in his experiences as a child and young adult in Dyess, AR. Considering the rural lifestyle of the Depression era midwest has completely disappeared, we're lucky Johnny Cash gave us such a lucid and authentic historical record. This is part 1 of 2 from my talk at the 2017 Johnny Cash Heritage Festival. Please read Part 2 for an analysis of specific audio qualities in Johnny Cash music.